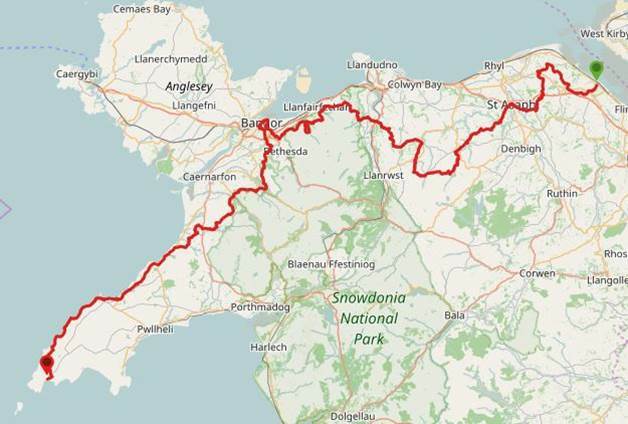 This past weekend I had the privilege to speak on pilgrimage places in Wales at the North American Festival of Wales. 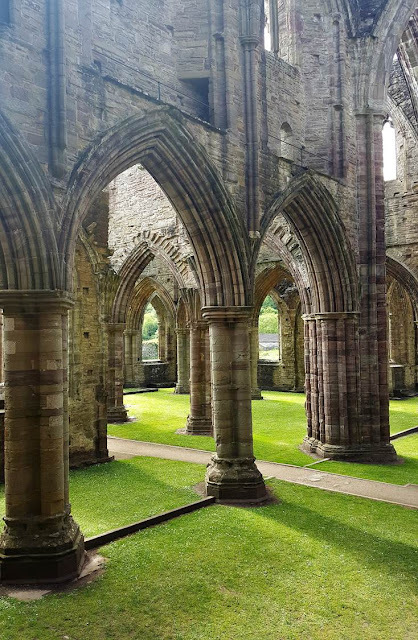 Wales has a rich history as a place of pilgrimage, long before the first Christians ever arrived or were formed in the country.Holy wells, lakes, trees, islands, and standing stones were sacred sites visited for prayer and ritual in the Iron Age and likely before. Some of these sites have been remembered as they were woven into the Christian story, like Virtuous Well aka St. Anne's well near Trellech. Others were lost to history and rediscovered through chance, such as Llyn Cerrig Bach on Anglesey Island. Most have probably been lost to us for good. 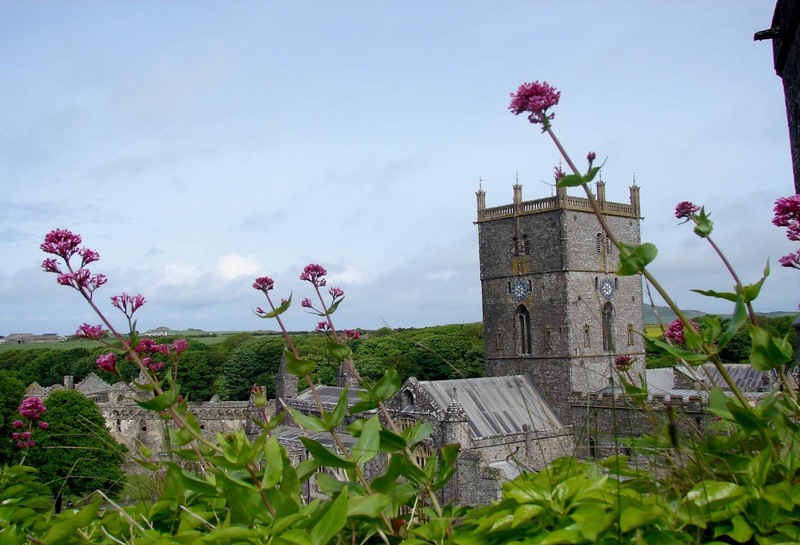 Likewise, there were probably more established pilgrimage routes leading to places such as Bardsey Island and St. David's Cathedral than are remembered. In 2013, pilgrims from Washington National Cathedral heard about the reclaiming of the North Wales Pilgrim's Way from some of the organizers of that project during the diocese of St. Asaph's "Year of the Pilgrimage" and then went on to visit some of the stops along that route. 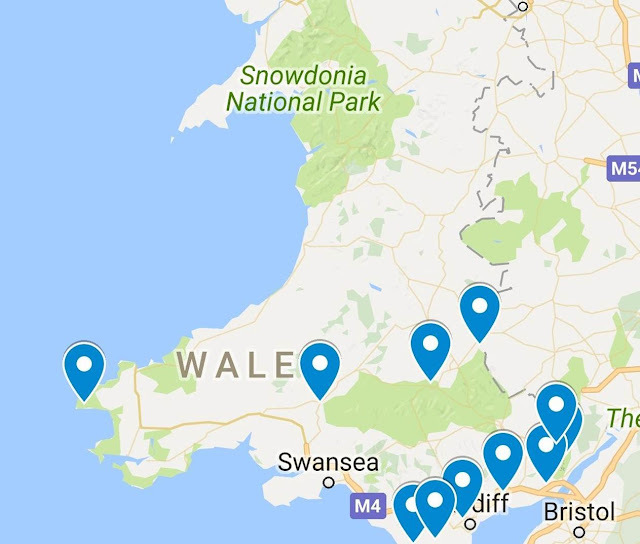 In my talks on Friday and Saturday, we traced that northern route from Basingerwerk Abbey to Bardsey Island as well as a pilgrimage trail in the south that leads from the Wye Valley along the coast to St. David's Cathedral. Below are a few maps and pictures of some of those sacred sites we virtually visited this weekend. Thank you to all who attended! Today is St. Patrick's Day and while some may be celebrating bedecked in shamrocks with a green beer in hand, for me this is the start of the season where I turn to St. Patrick's Lorica as my morning meditation. A lorica, from the Latin word for body armor, is a prayer or blessing for protection. Often said in the morning or before the start of a journey, a lorica wasnâ€™t recited as much to invoke the Spirit, which is always present, rather to remind the one praying of the presence of the Holy that is always with us. When these types of prayers were said it was customary for those praying to stand and draw a circle around themselves with their index finger to symbolize the encompassing power of protection they were invoking. While some loricae are simple invocations, others, such as the Lorica of St. Fursey and the Breastplate of Laidcenn, go through an inventory of the body, asking for protection from head to toe, inside and out. And to God, the Father of all, my entire being. With your impregnable power and protection. Into my side, as is their wont. Joints, fat, and two hands. To snout, lip, face, and temple. To gums, breath, jaws, gullet. The area of the buttocks, nates with thighs. Shanks, feet with their soles. I shall not sicken in any organ inside or out. likely written by someone other than Patrick (calling on the strength of Heaven as demonstrated in the natural world probably would have smacked a little too much of the pre-Christian druidic and bardic prayers for Paddy to be comfortable with), it serves as a good compass to point us back to the spiritual legacy of the saint. To read more about Patrick, in his own words, his Confession can be read here. When I went to bed late Monday night, the half moon shone dimly on a blanket of snow. I woke up the following morning to the sound of freezing rain bouncing off ice covered trees. By the time I left for the Cathedral, the last traces of snow and ice were melting in the margins of sidewalks and muddy yards, washed by a steady rain. As I parked my car and walked to the building where I had my first meeting, the sun shone warm on my back as robins, cardinals and blue jays congregated in the grass for a late lunch. Welcome to Imbolc, the season of change and transformation-- sometimes all in the course of one day. Since we were still recovering from our first big snow of the year when February 1 rolled around, I've delayed posting about the season until I could see the tiny tell tale signs of early spring emerging from the thawing earth. On the Celtic calendar, February 1 is the beginning of the season of Imbolc, early spring, and the celebration of the feast of St. Brigid. The veneration of Brigid is one of those interesting conflagrations in Celtic spirituality, the coming together of a pre-Christian goddess and fifth century saint whose stories have been woven together to create a tapestry of legends that continues to intrigue and inspire. Brighid the goddess invented keening after the death of her son and, according to the story, was the first one to whistle in the dark to let others know of her presence. Brigid the saint traveled through time, had a magic cloak, and always seemed to find a miraculous way to provide for the sick and needy who crossed her path. They were wise women, known for their powers of healing, and both goddess and saint are credited with being keepers of the flame and patrons of poetry. Part of following the path of Celtic spirituality in the 21st century is re-imagining the rituals of the past to fit the world of today. Many of the ancient rituals of Imbolc focus on hearth and home, a realm watched over by Brigid. Cleaning out clutter, kindling the hearth, lighting fires, and inviting the holy to cross the threshold are all activities for the first stirrings of spring. Below are a few rituals, rooted in traditional celebrations of the season. In some areas of Ireland, the household rites associated with the Feast of St. Brigid began with the head of the family walking around the house three times, to bless the dwelling and those within before Brigid was invited to enter. As many of us are twenty-first century urban and suburban dwellers, walking around your â€œhouseâ€� may necessitate walking around an apartment building, townhouse complex, or even a city block. As you walk, walk slowly and prayerfully, focusing your intention on bringing protection and well-being to all those within the parameter of your walk. Whether she was churning a never ending supply of butter, turning well water into ale, or feeding a stray dog meat from a pot of soup meant for her fatherâ€™s guest, Brigid was always ready to share food and drink with strangers and friends, animals and humans alike. Often the household rituals on her feast day included some sort of communal or family meal. Extend hospitality by sharing a meal with friends, family or neighbors. Carefully consider what dishes to prepare. As Brigid is the patron saint of cows and dairy farmers, you might want to include cheese, milk or butter as part of your menu. And she also liked beer . . . a lot. For thousands of years, a sacred fire burned in Kildareâ€”first honoring the goddess Brigid and later kindled and kept by the community who honored Brigid the saint. Light a fire/candle on Imbolc and invite the three fold blessing of the flame for transformation during the coming year. On the Celtic calendar, May 1 is the celebration of Beltane, the first day of summer. 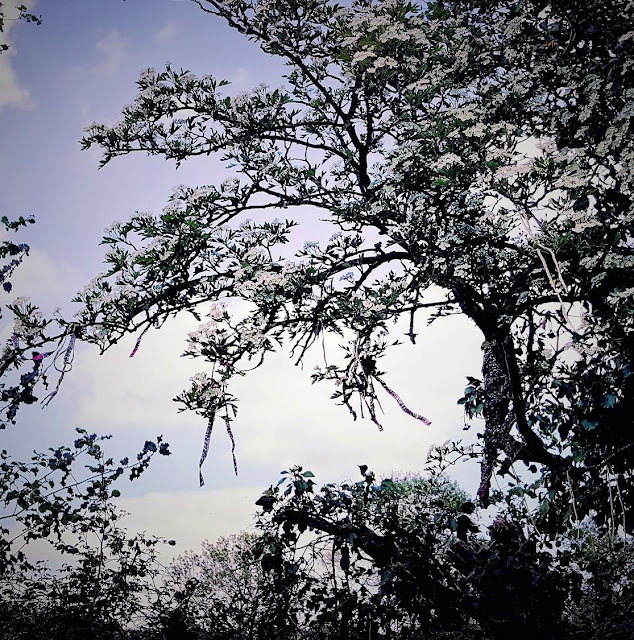 In the pastoral world of the Celtic peoples of long ago, the first day of May (or thereabouts) marked the transition from budding spring to blossoming summer. The rituals surrounding Beltane--dancing around May poles, courting rituals, honoring the blossoming of flowers and greening of trees-- symbolize the energy of new growth and fertility evident in the natural world during this season. Beltane is also a time of transition and purification. Households would douse their individual fires and relight them from a common bonfire, lit on the evening of the celebration. Livestock were often driven through a path between two bonfires in order to ensure fruitful breeding seasons. Sometimes oatcakes or bags of flour were shared around the communal fire to ensure a good harvest. 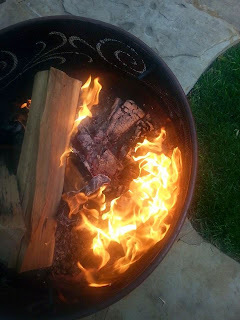 While most of us no longer dance around be-ribboned poles or sit around bonfires on May 1, Beltane does offer us an opportunity to reflect on where we are in the cycle of life: new growth, fertility, or transition and purification. For more suggestions for spiritual practices for the season, click here ..
Just as the new day in the Celtic tradition begins with nightfall, so too does the new year begin as darkness closes in around us. Samhain (pronounced sow-in) starts at sun down on October 31 and marks the beginning of the new year on the Celtic calendar. Like other threshold times and places, the beginning of Samhain, is a thin time when the veil between heaven and earth, this world and the next, is particularly permeable. 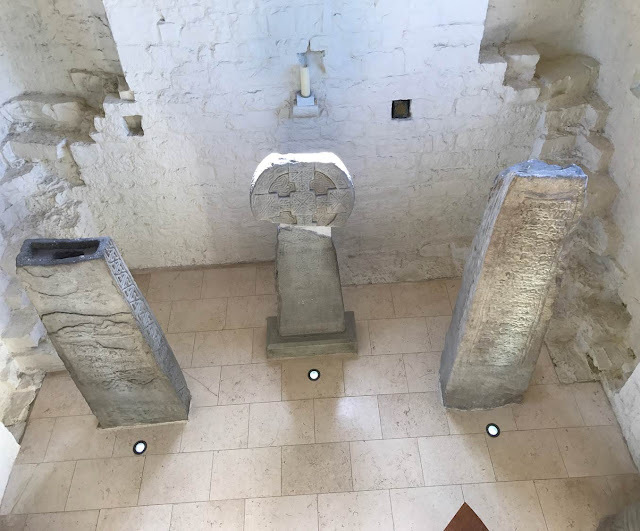 It was thought that this liminal time allowed the ghosts of ancestors to come back and visit their former homes, along with more undesirable visitors from the other world who managed to sneak through. Many of our Halloween traditions come from this idea of discouraging the not-so-friendly spirits from visiting. 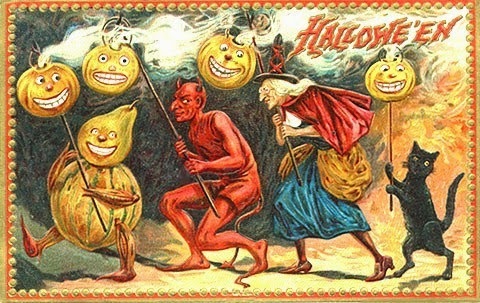 Jack-o-lanterns carved from rutabagas or turnips were placed in windows or by doorways to frighten away trickster spirits. In case scare tactics didn't work, treats of food were left as offerings for the ghosties and ghoulies and faerie folk who might be out wandering on Samhain night. Later customs saw people dressing up as these creatures, going from house to house to collect the treats and sometimes playing a trick or two on their neighbors in the process. Community bonfires are one of the earliest Samhain traditions. Bonfires were lit in the hills or in the center of towns to keep the evil spirits at bay. As people left their homes to participate in revelries with their neighbors they'd extinguish the fire in their hearths. Before returning home, they'd take fire from the communal bonfire in order to light their home fires afresh, often encircling their houses, barns and fields with the new fire as a form of purification and blessing. In practical terms, Samhain was a time to finish bringing in the last of the harvest, move livestock from their summer pastures to shelter closer to home, and to begin to settle in for the long, dark months of winter where light and resources were scarce. It was a season not only to take stock, but also to plan for the year ahead. Spiritually, Samhain offers us the opportunity to honor those who have gone before us. Festivals such as Dia de Muertos and All Saints and All Souls day on the Christian calendar invite us to give thanks for the wisdom of our ancestors and the inspiration of the saints who have shaped us. During Samhain as we reflect on those who have passed out of this life, we are also called to take stock and consider the things that may be germinating in the dark, waiting to be born into this world. Samhain is a time to douse the embers of the old fire and kindle new the sparks of new passion and energy in our lives.